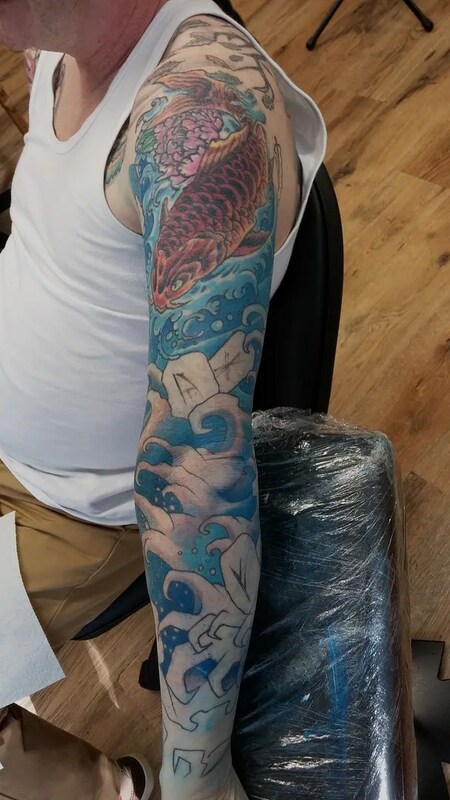 wee Angie’s koi didn’t have any colour for the longest time, glad we finally sorted that! 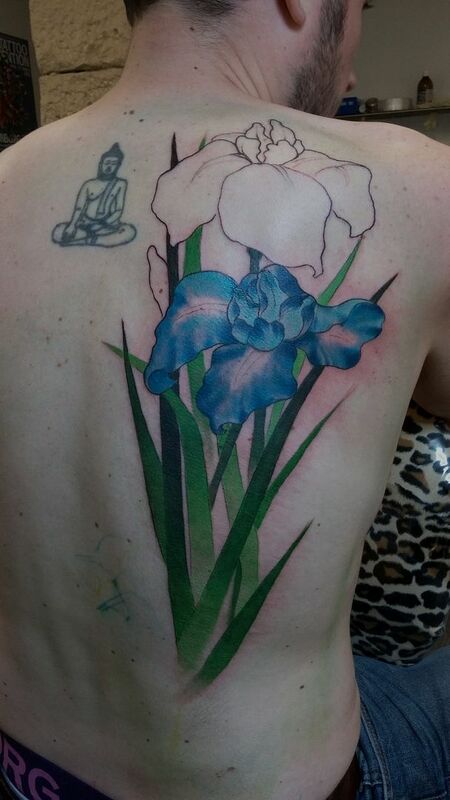 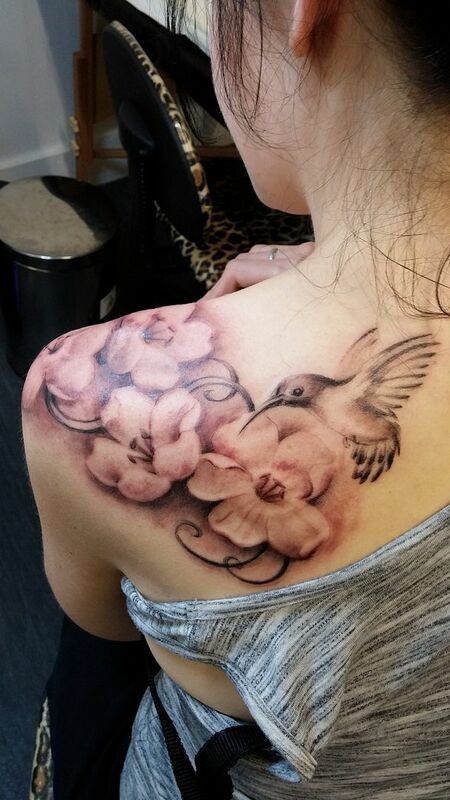 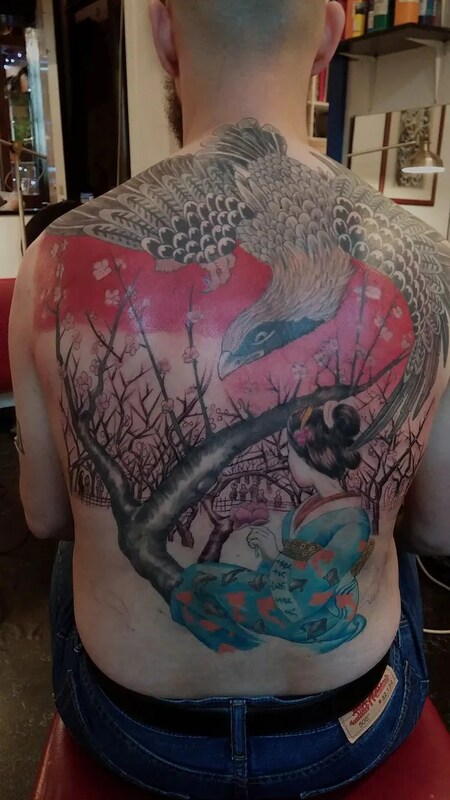 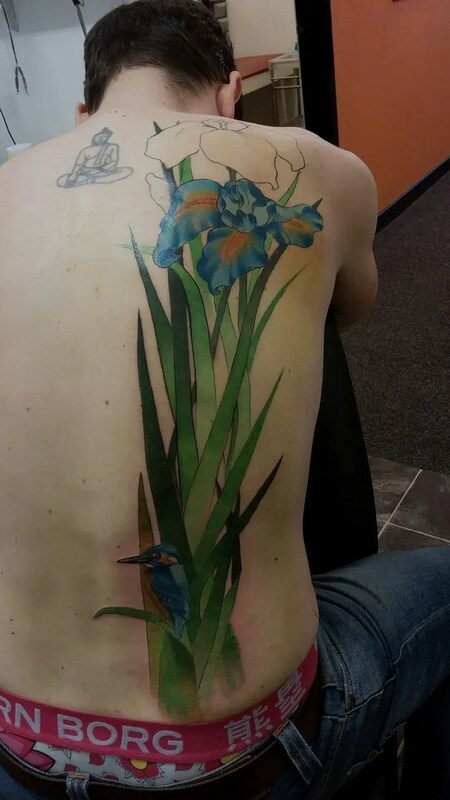 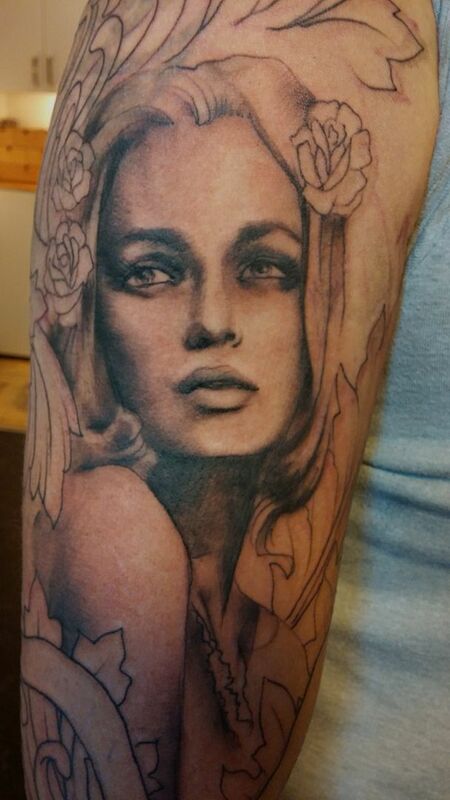 Robbie’s iris and kingfisher piece is getting there, just one more short session. 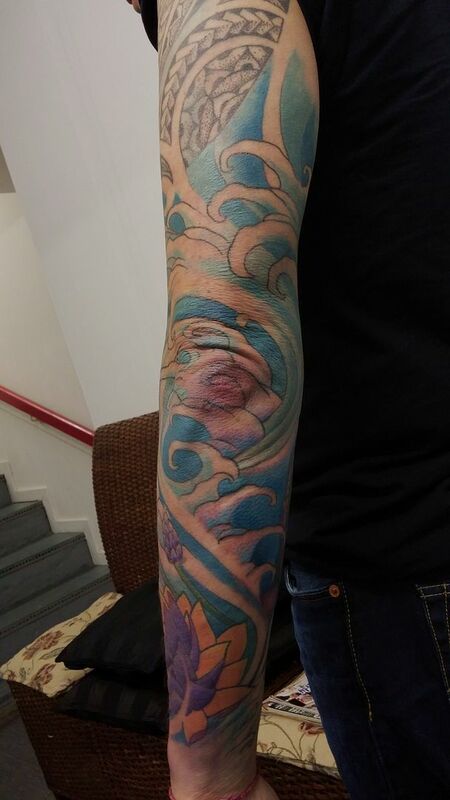 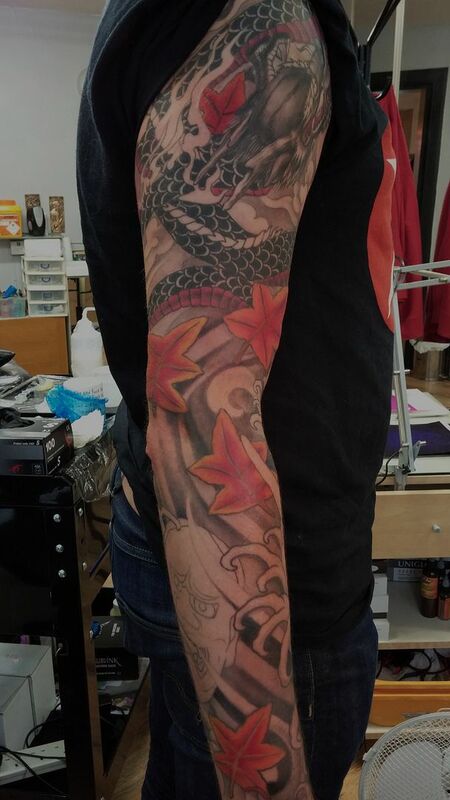 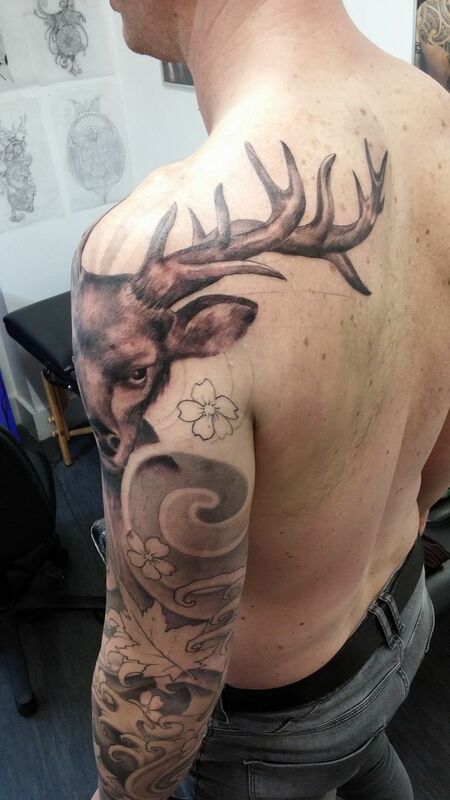 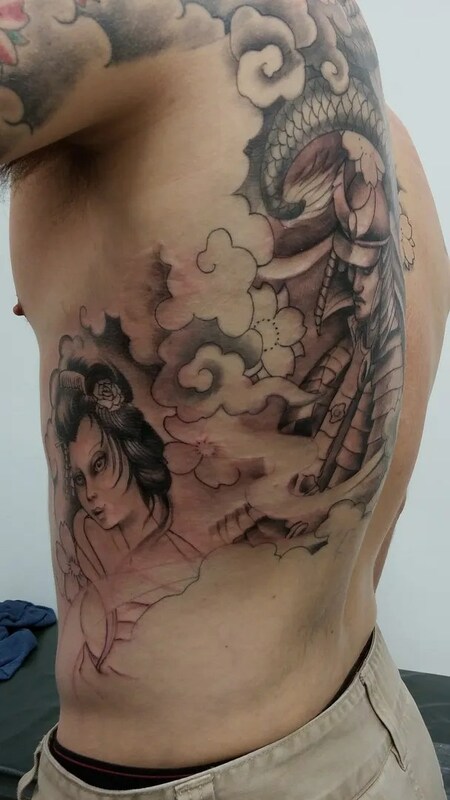 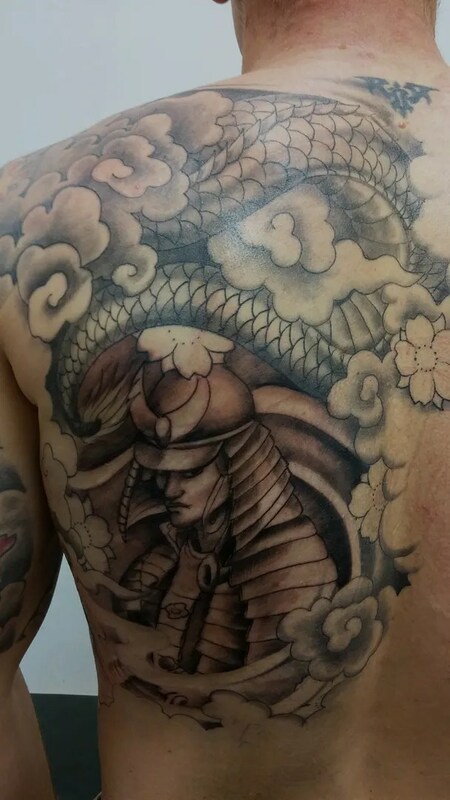 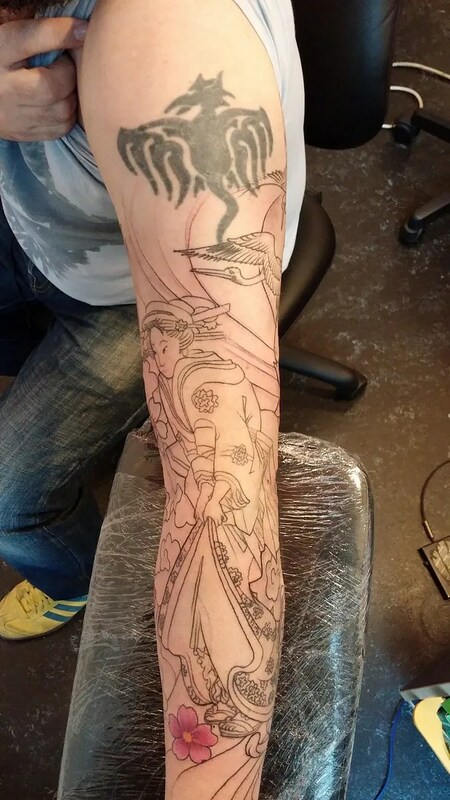 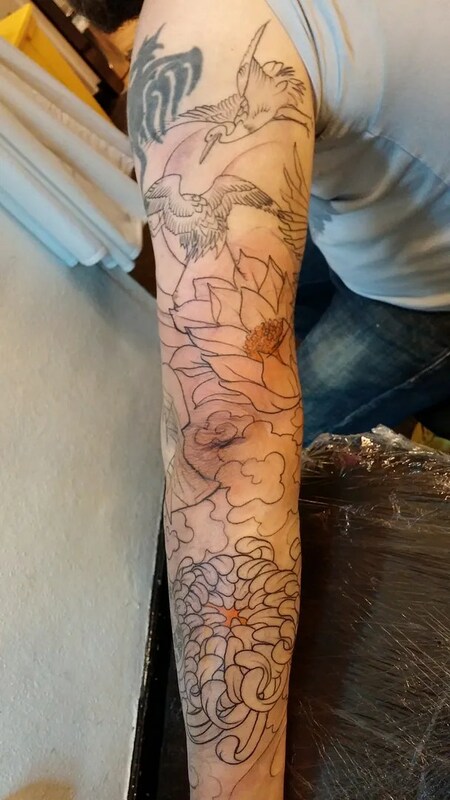 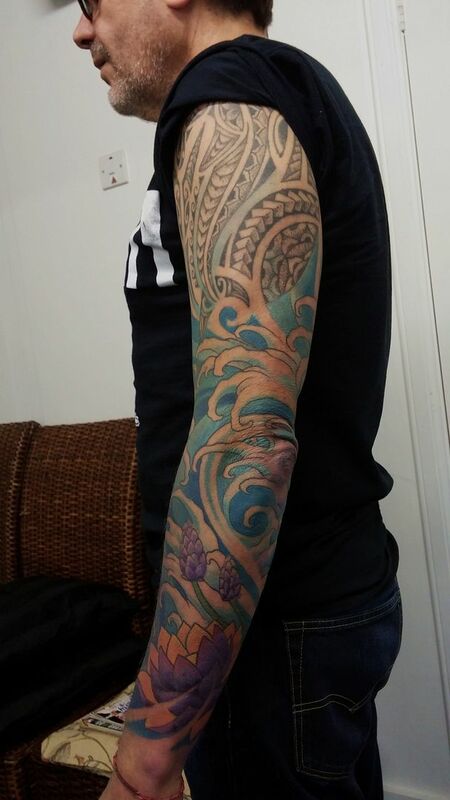 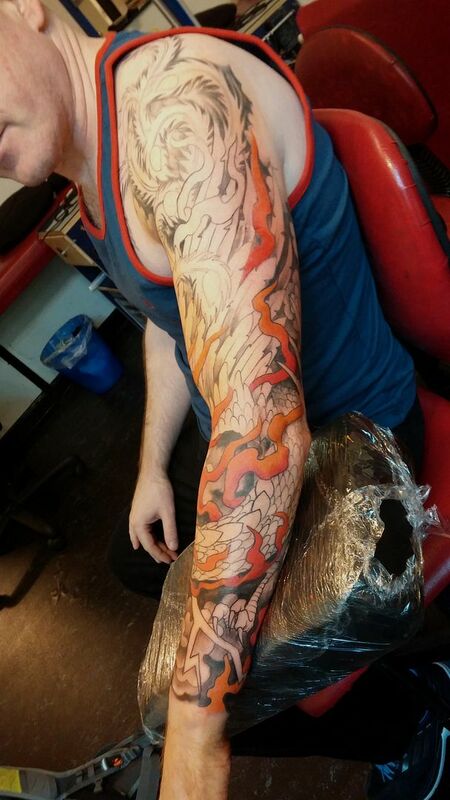 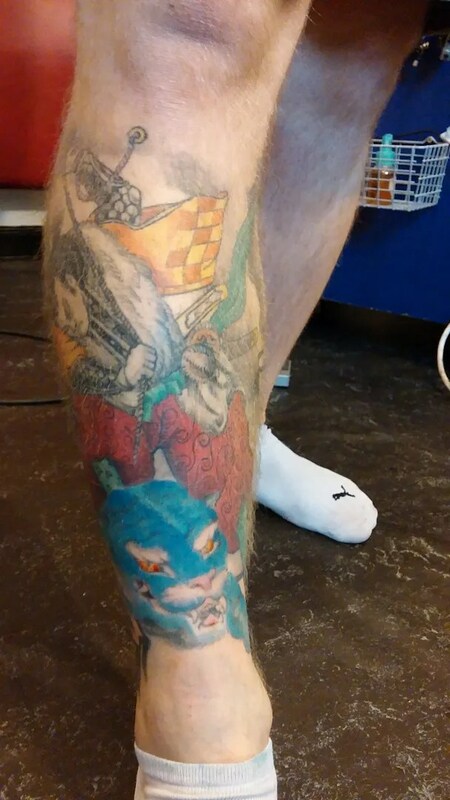 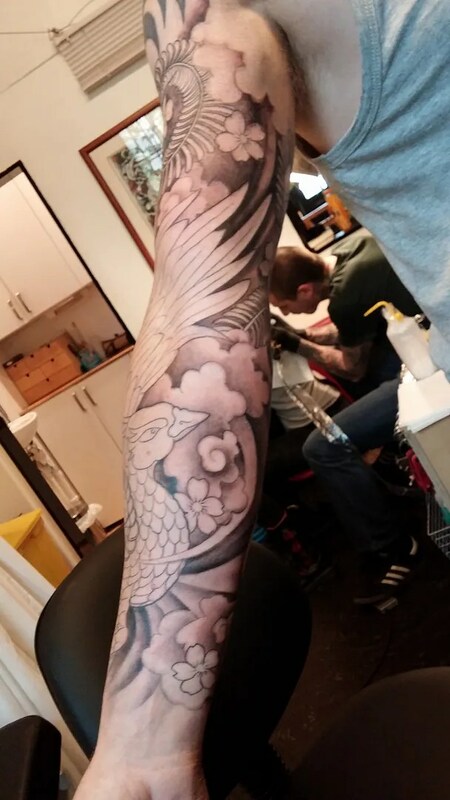 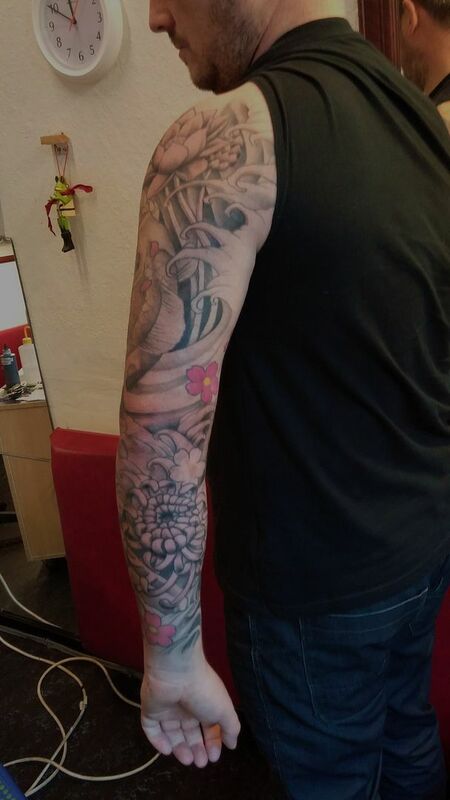 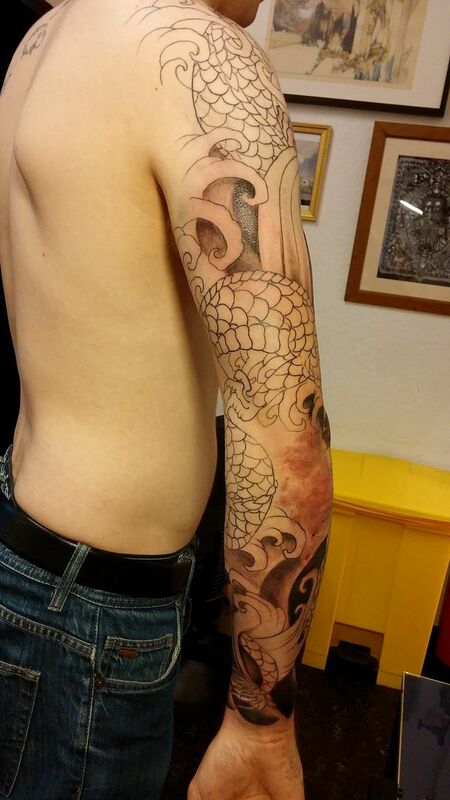 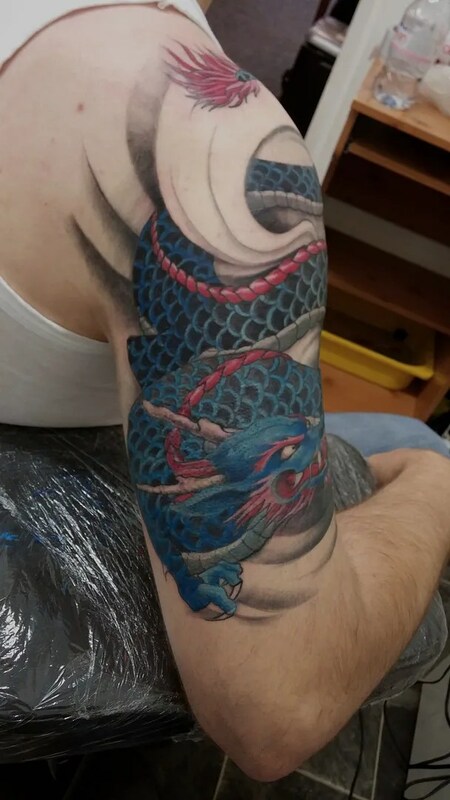 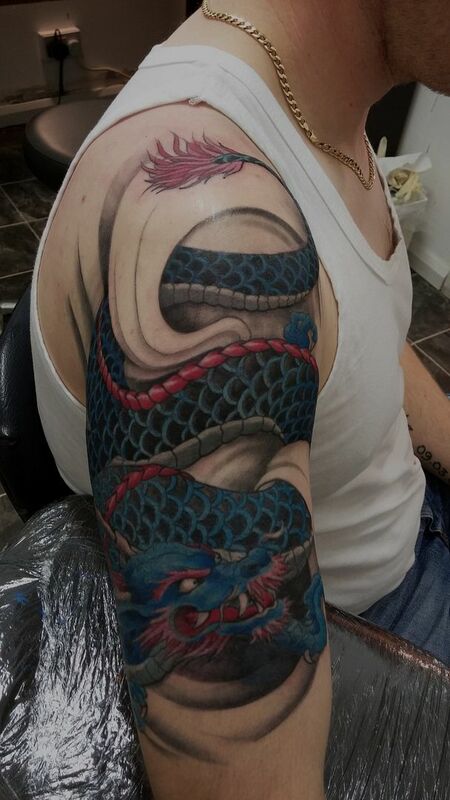 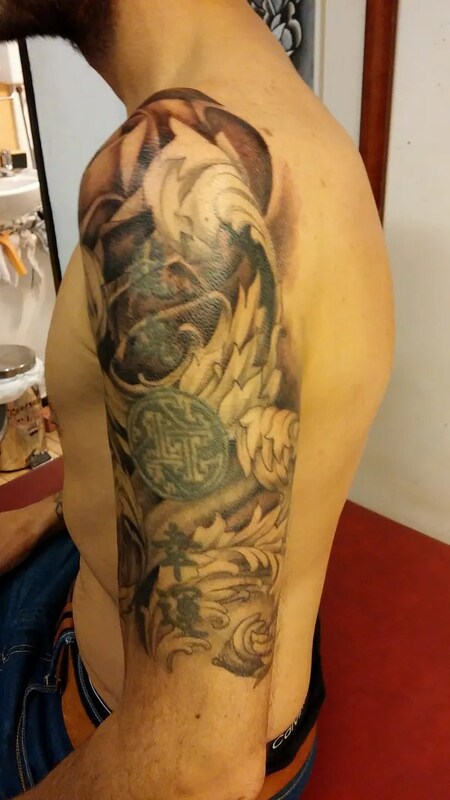 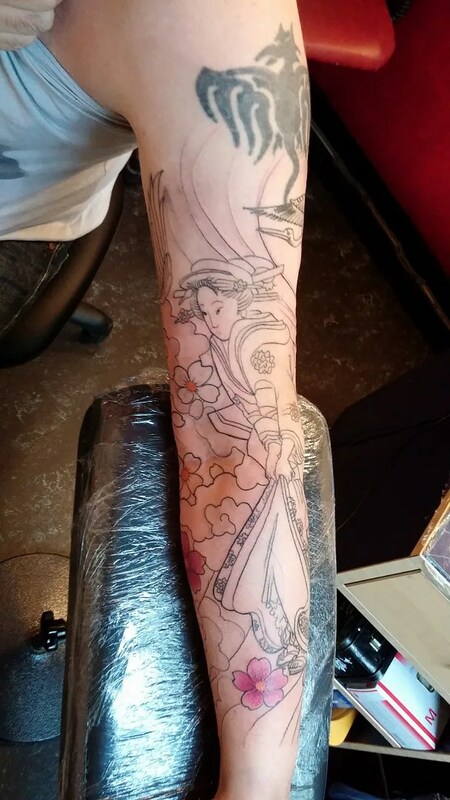 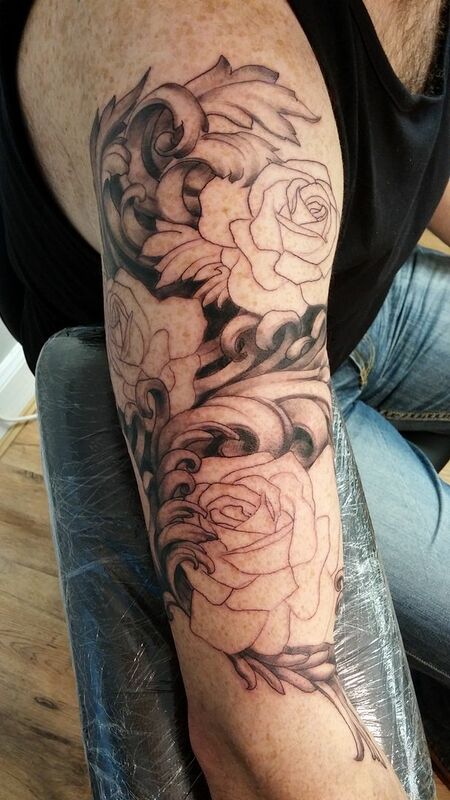 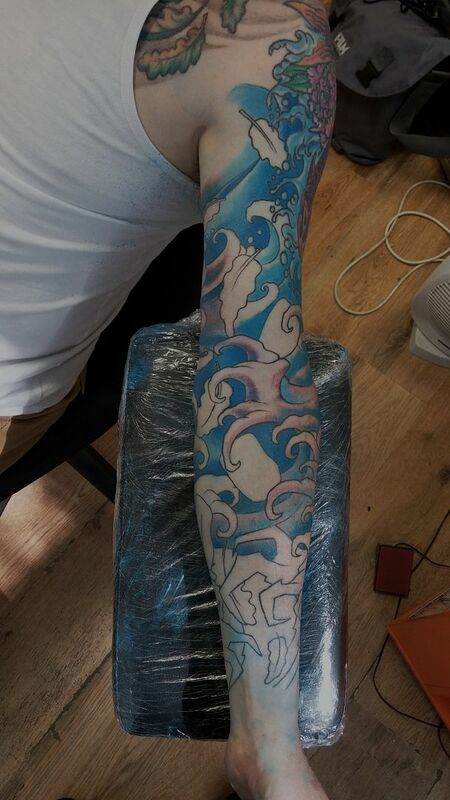 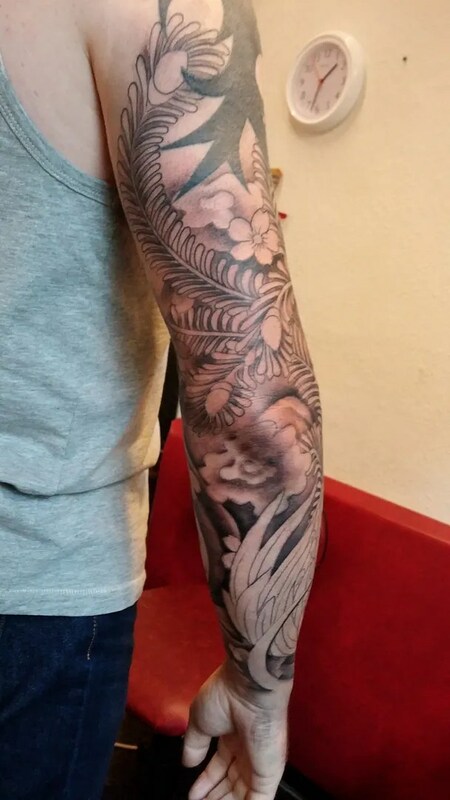 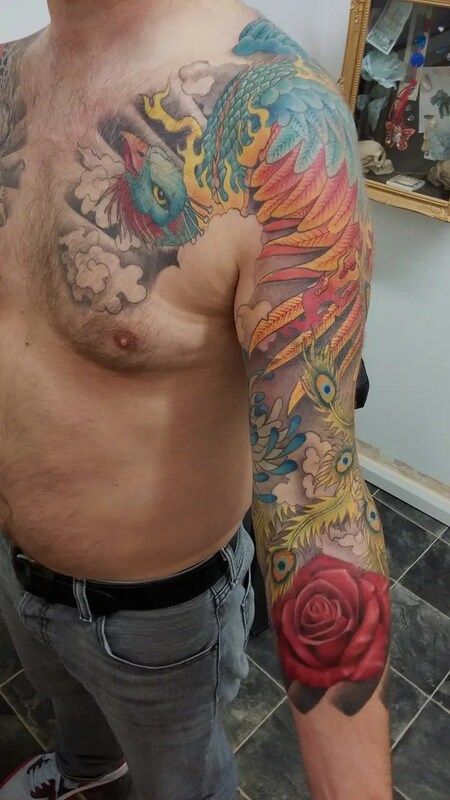 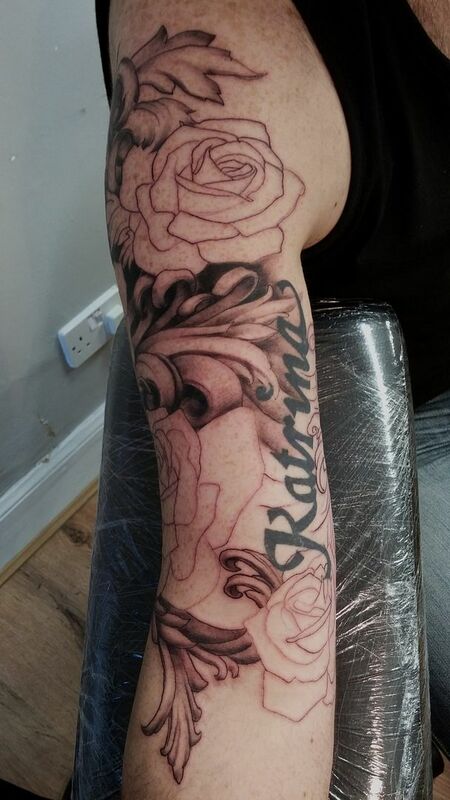 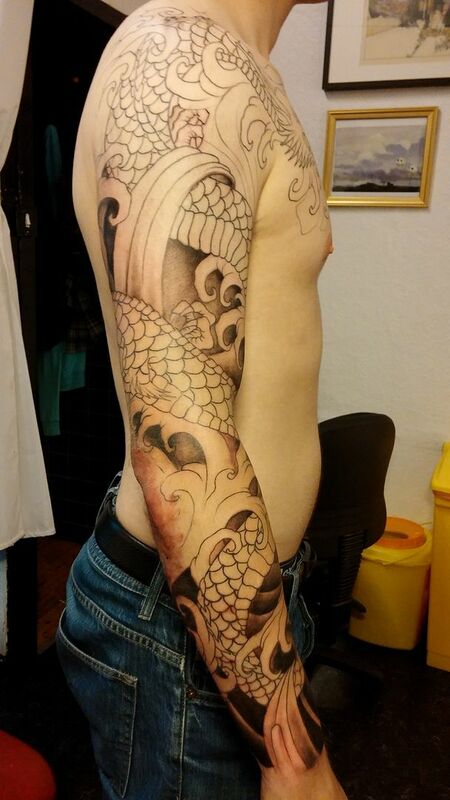 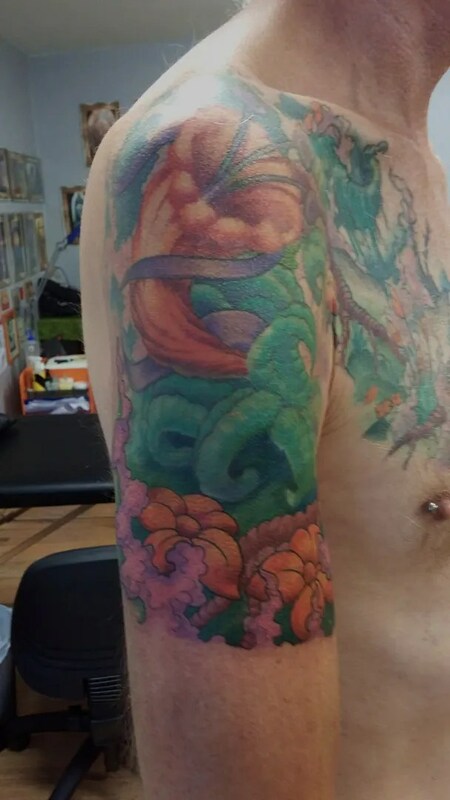 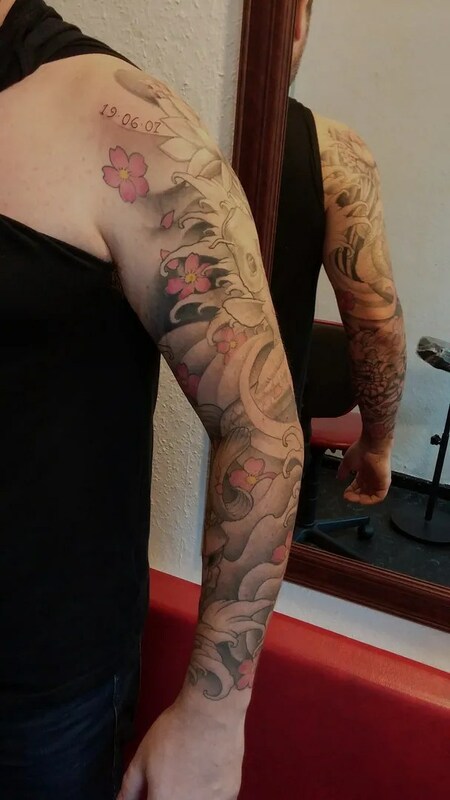 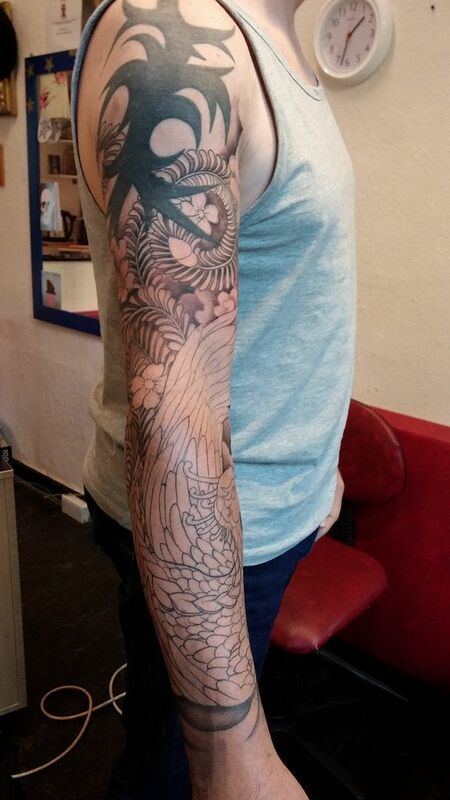 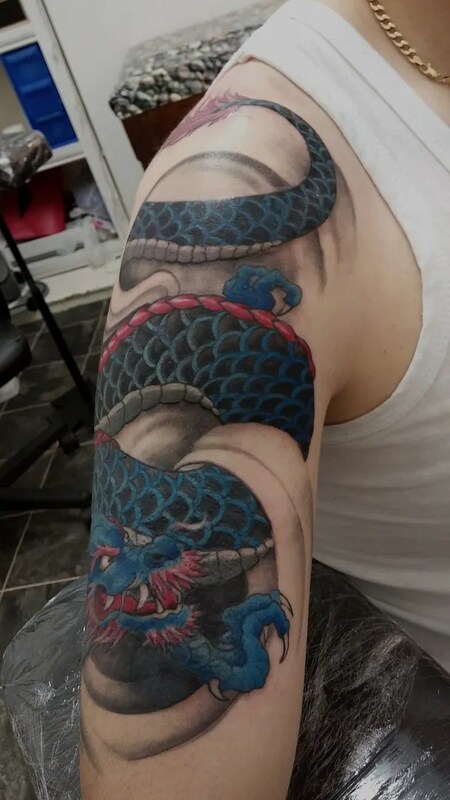 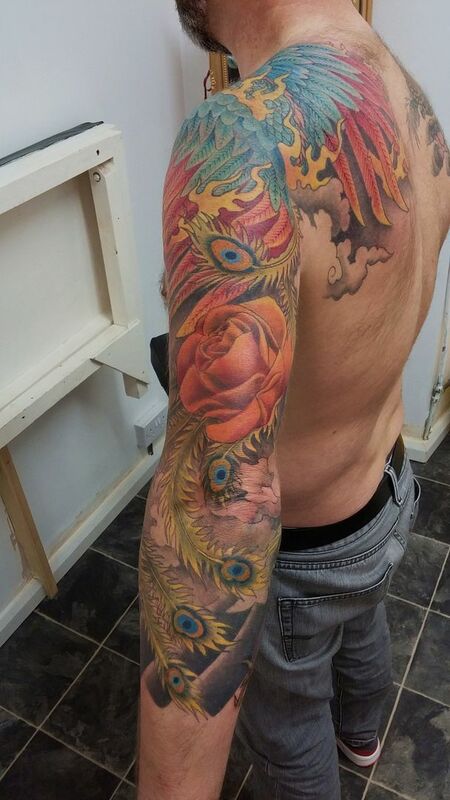 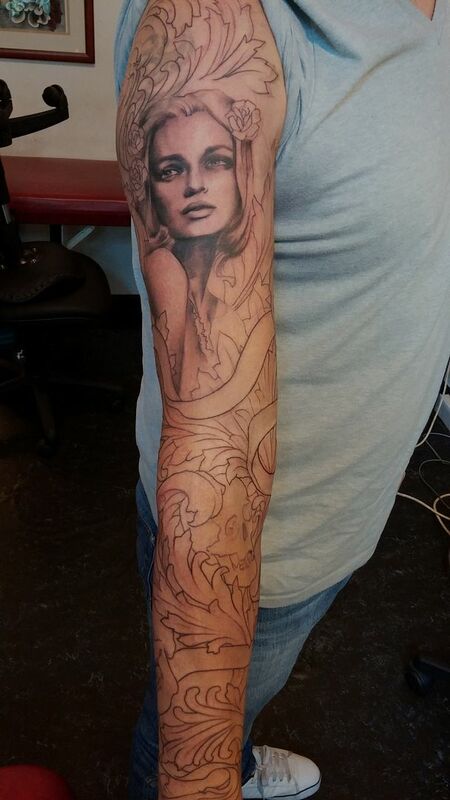 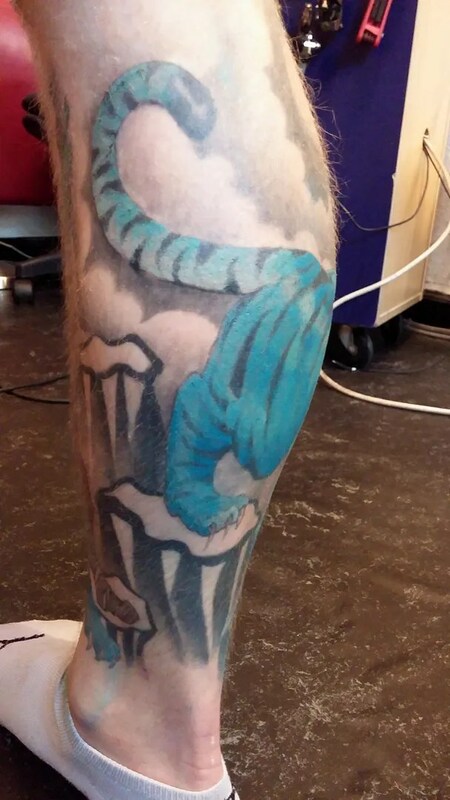 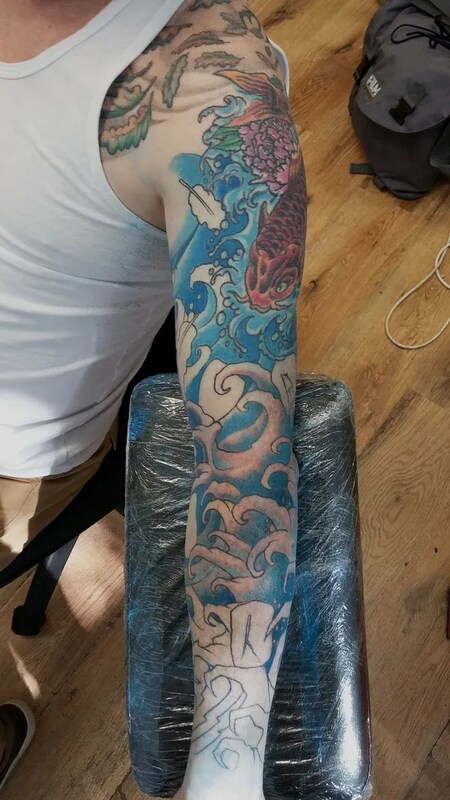 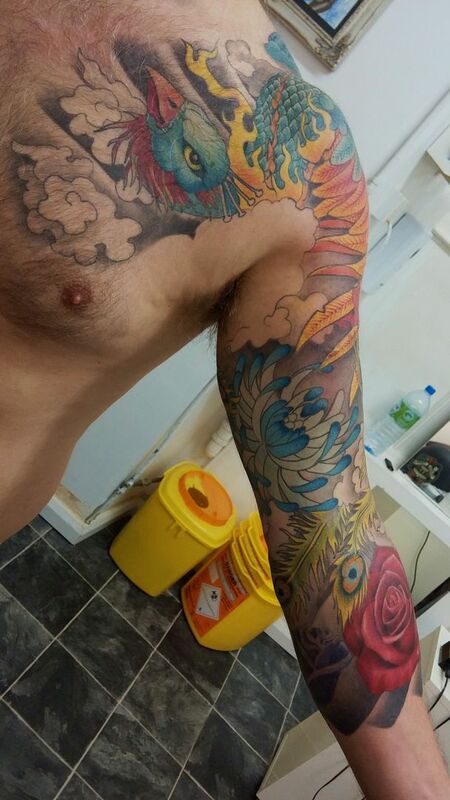 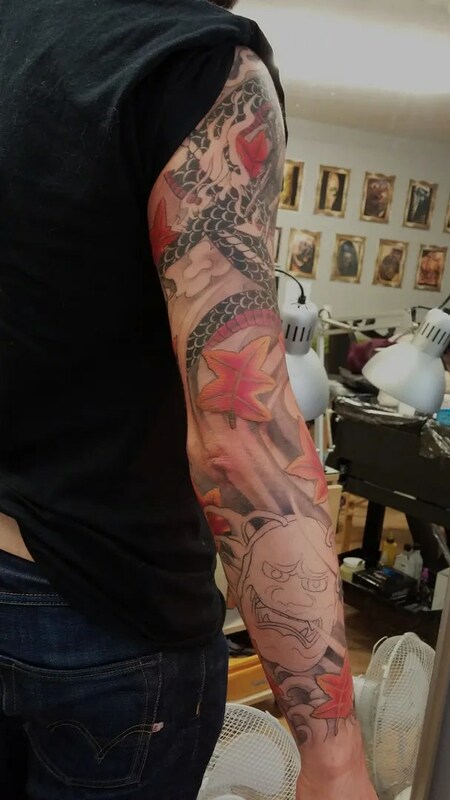 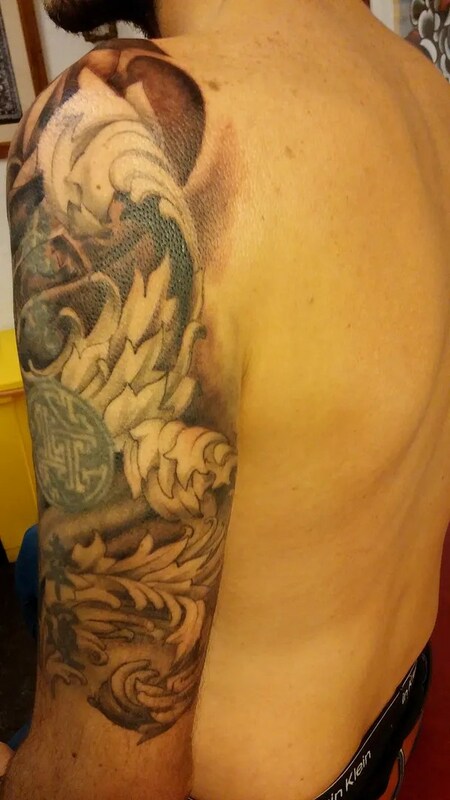 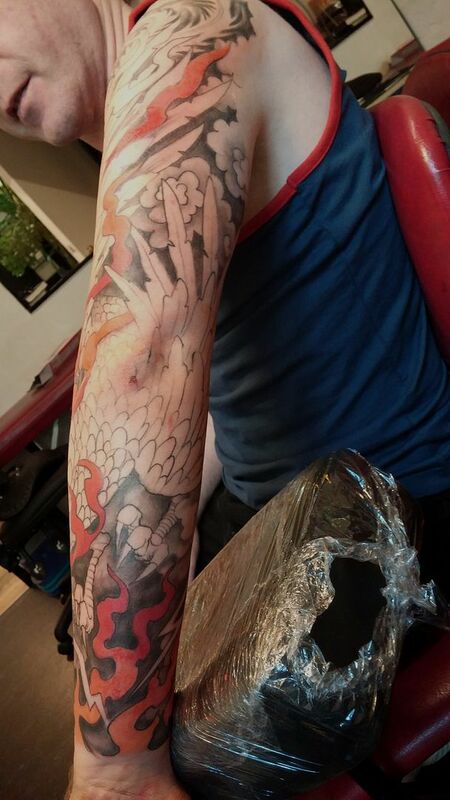 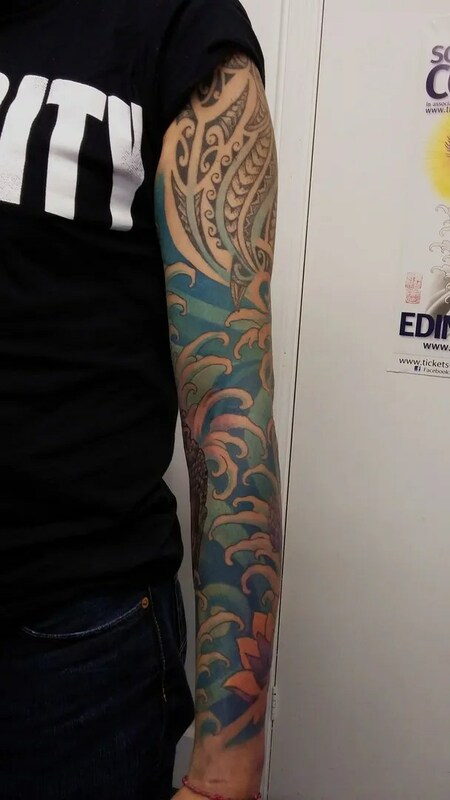 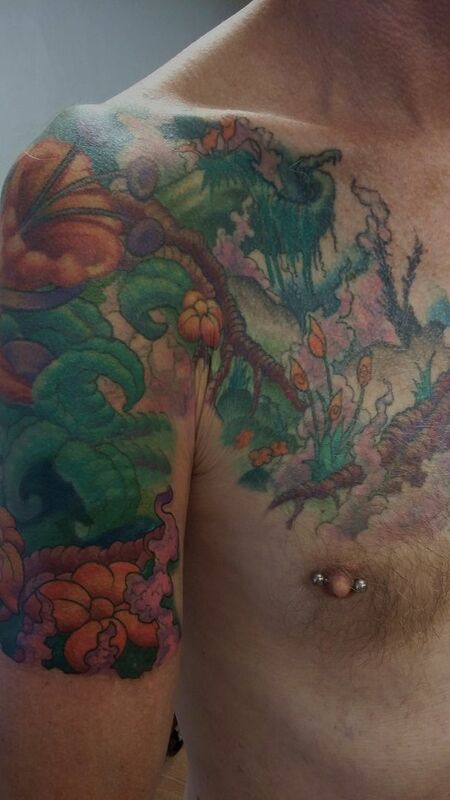 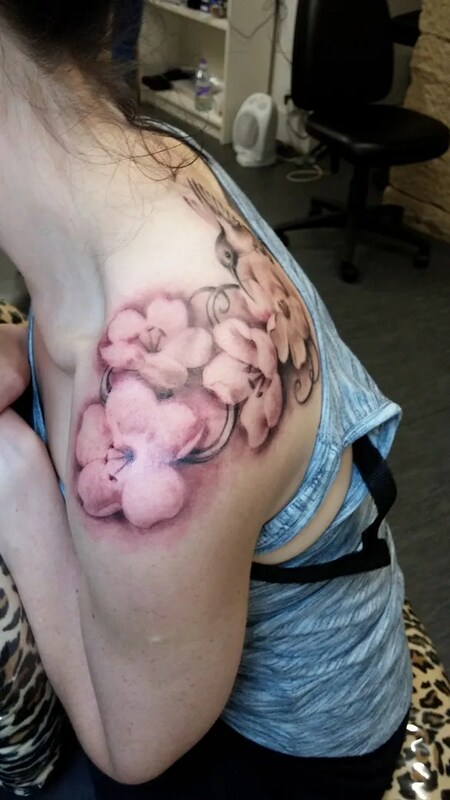 Alistair is in for his first ever piece, a dragon and koi sleeve…go big or go home haha! 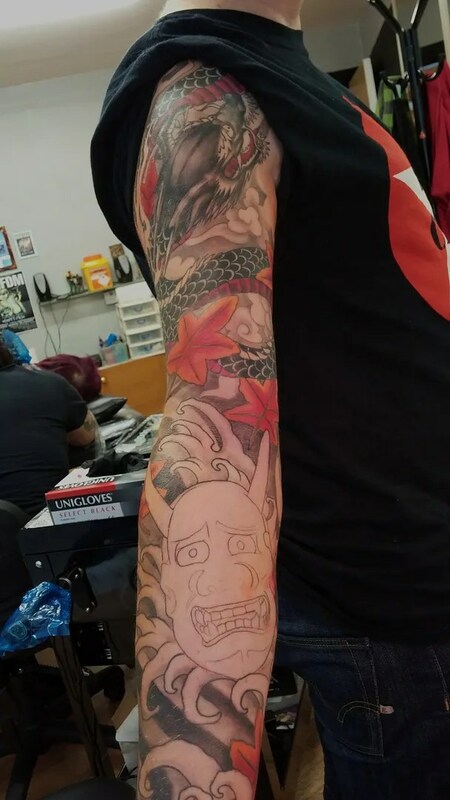 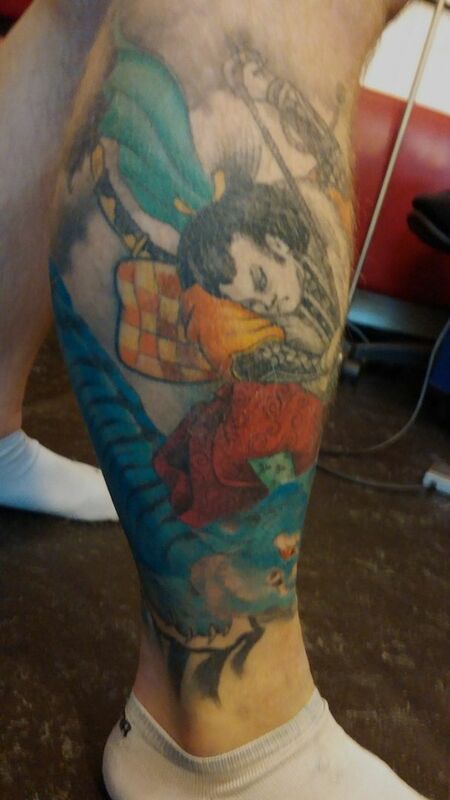 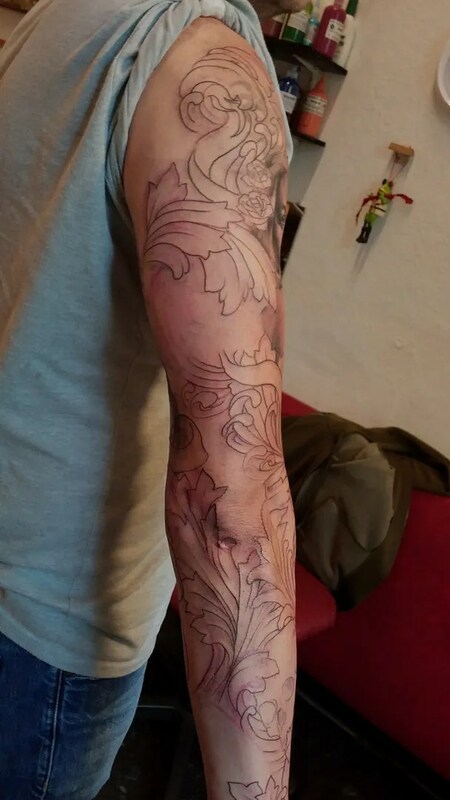 another session on Rick’s sleeve, today we got some colour in the autumn leaves, next time we will do the theater masks, and we are getting there! 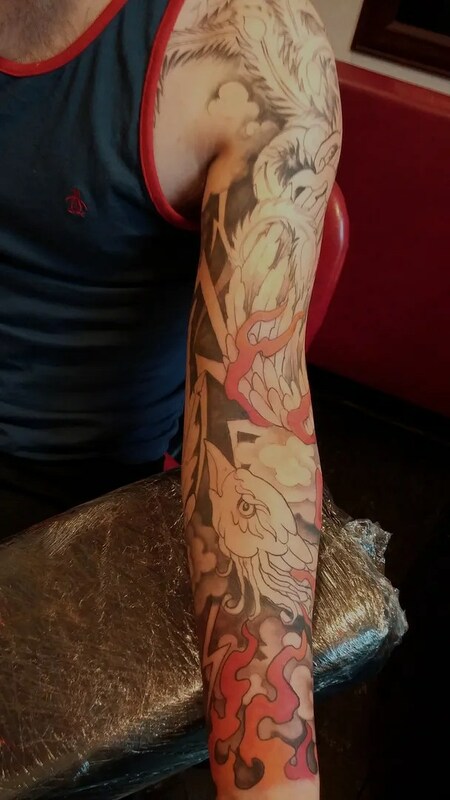 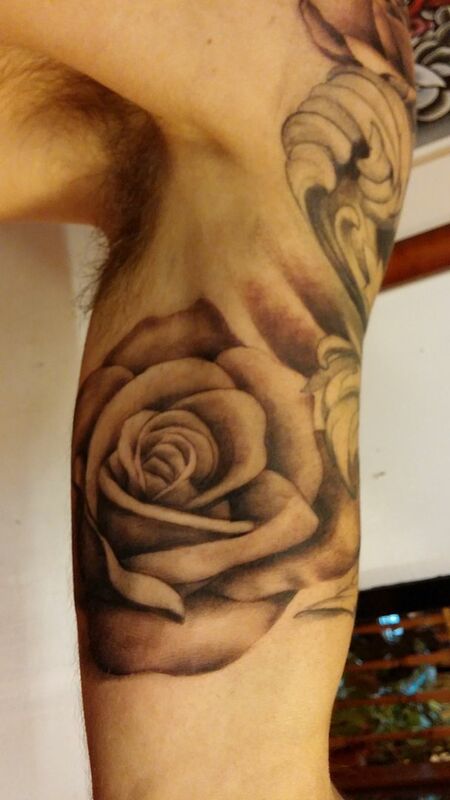 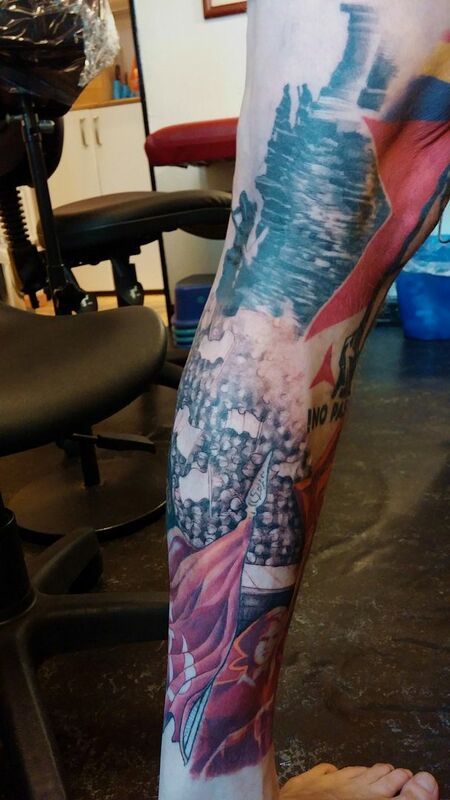 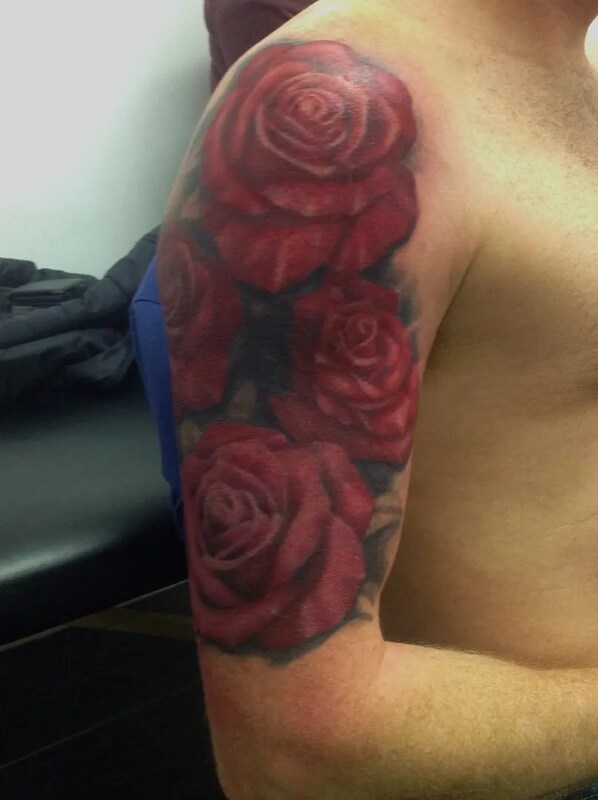 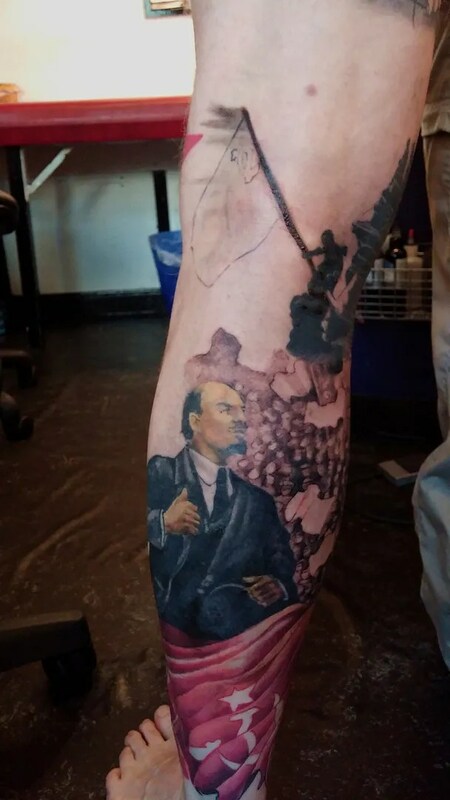 We finished carlo’s sleeve! 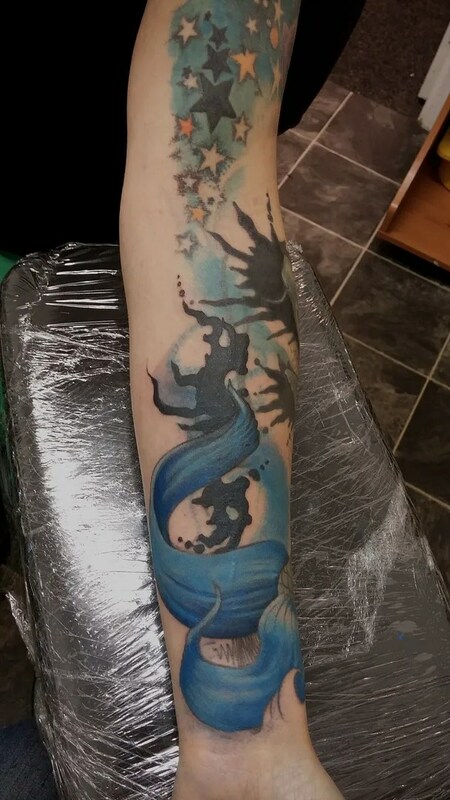 It’s been a collaboration with Raffi, 9sort of) I added my piece onto hers, even though our styles couldn’t be more different. 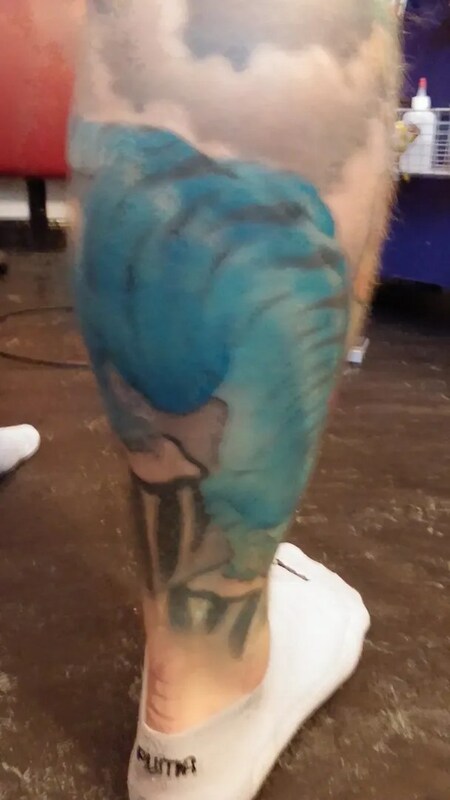 I continued the flow that Raffi had started with her Polynesian piece, and as there is an abstract dolphin in hers, we went for a water theme. 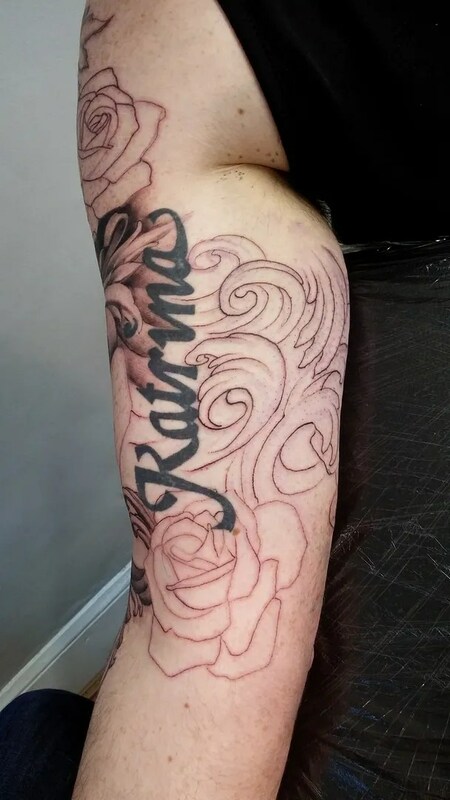 we had done everything, but left a gap for something- something that took a while to decide upon. 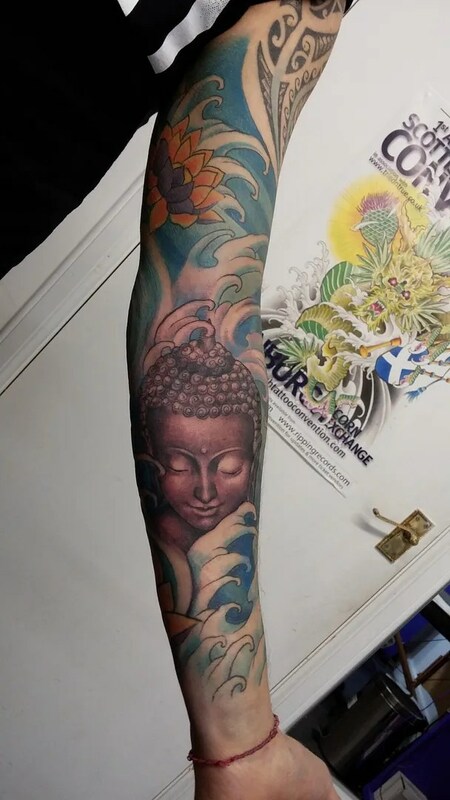 In the end we went full circle and went with the original idea of a buddha head. 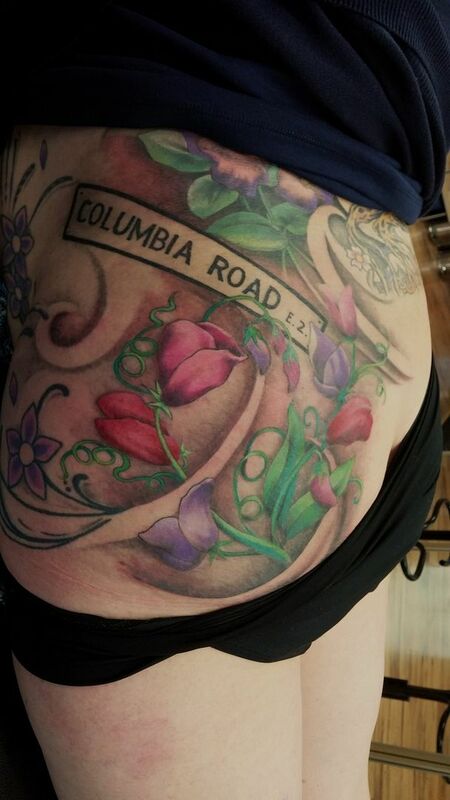 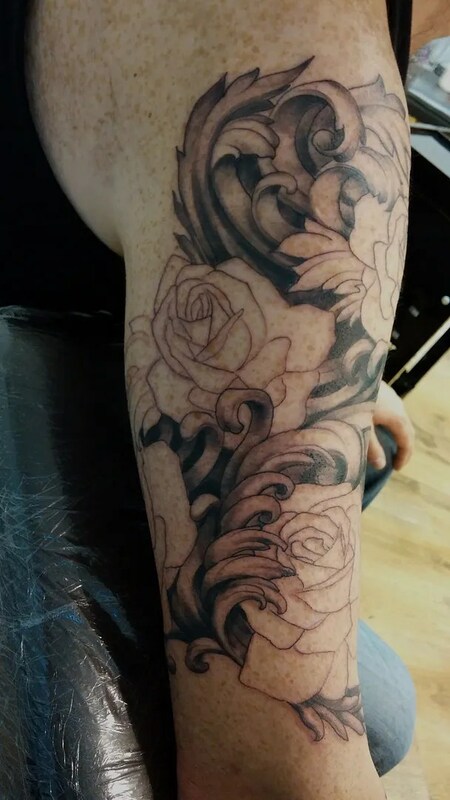 I think the black and grey of it picks up the black in raffi’s piece well, and I’m pleased with how the whole thing turned out! 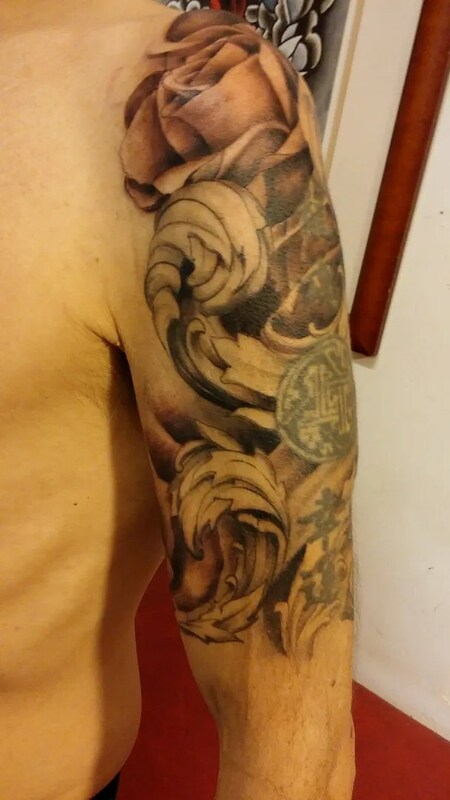 Another piece with scroll work, Matthew was after a sleeve with the central motif of the passing of time. 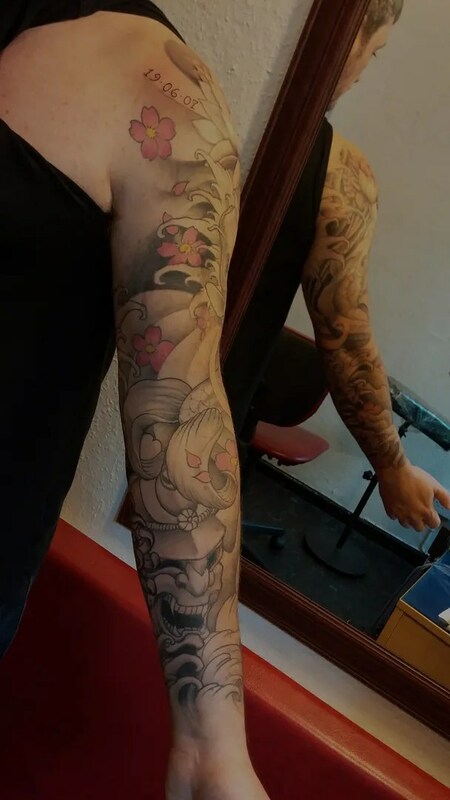 He fancied skulls, and a mexican day of the dead lady, with lots of 3d scrolls tying them all together. 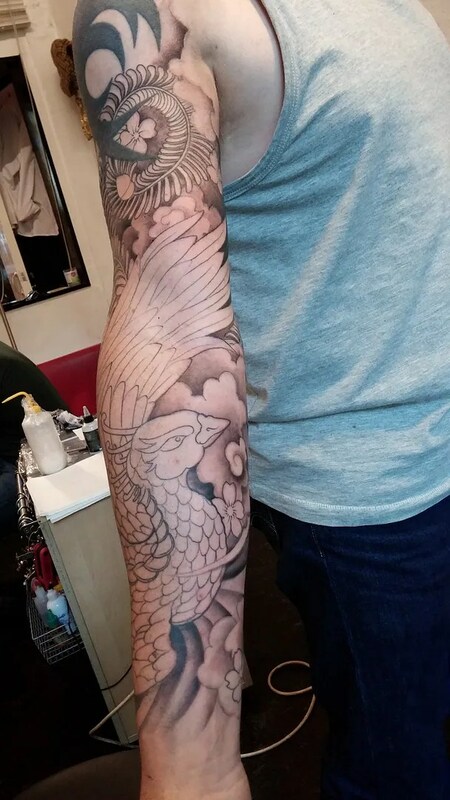 There will be a pocket watch and a winged hour glass, too, we have left gaps for these. 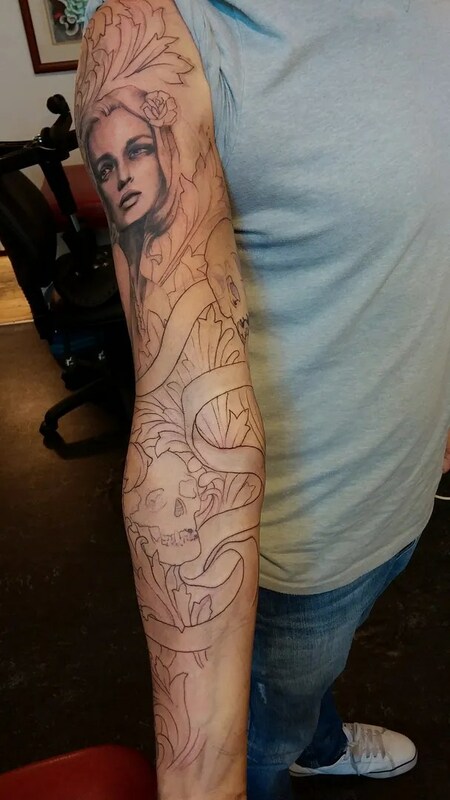 And if you are wondering where the day of the dead lady is, the is there, but she hasn’t got her make up on yet! 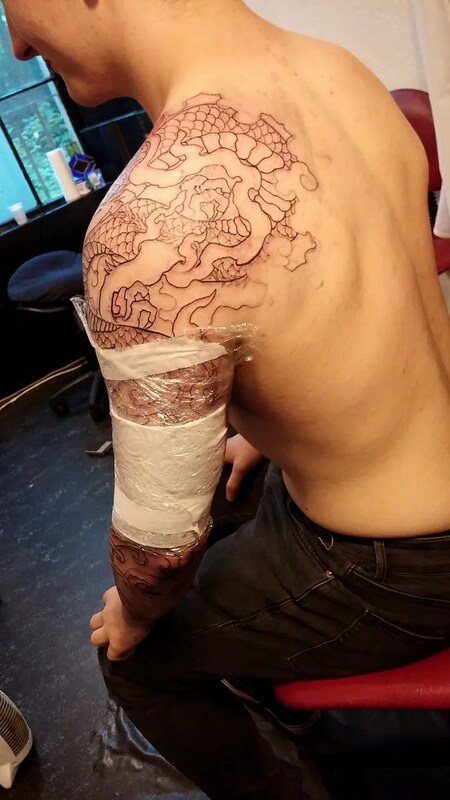 that will happen next time. 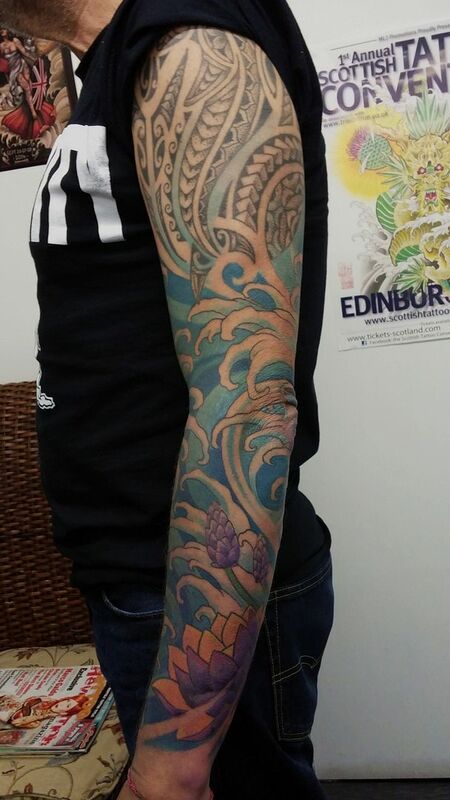 I’ve had a lovely month off, did some edinburgh festival stuff, visited family, went camping and generally had a lot of fun. 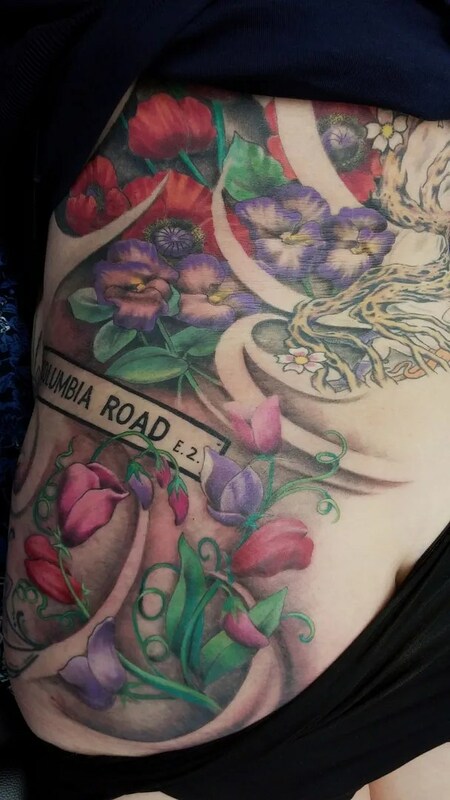 I’ve never taken a month off before, so this was a bit of an experiment- taking all my holidays at once- but i certainly didn’t get bored! First smiling face through the door was Simon, we had started a phoenix sleeve last time, and worked on the background today. 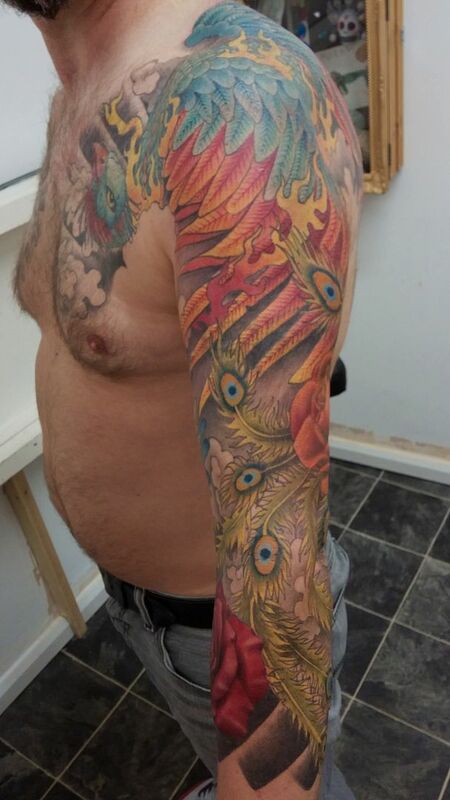 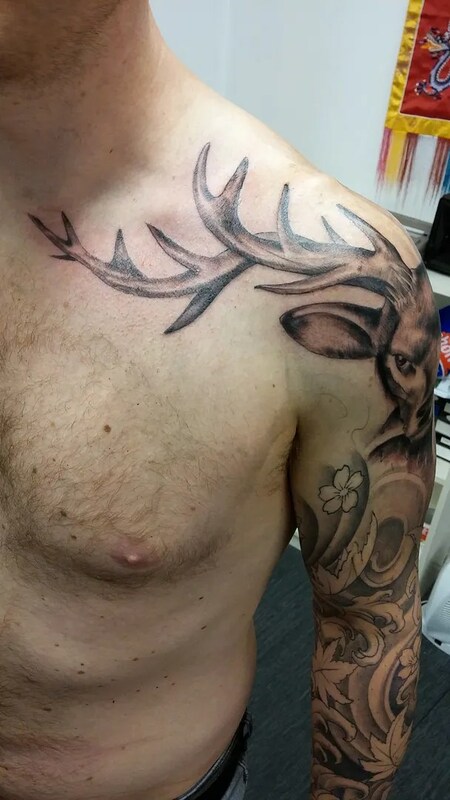 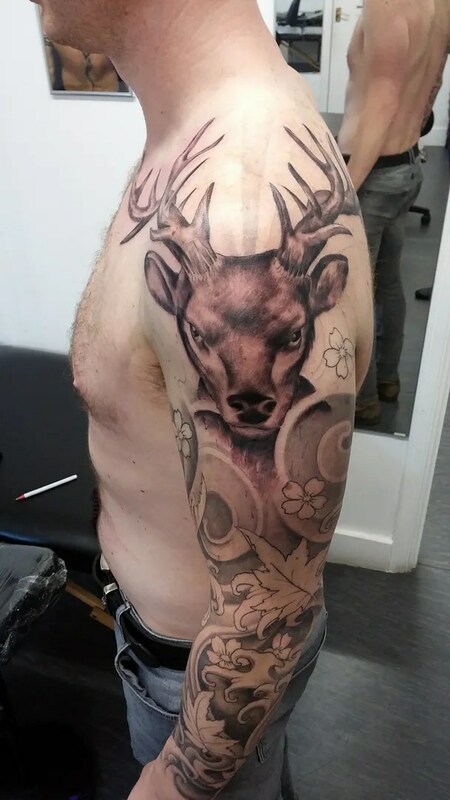 We will be bringing the piece up and around the tribal at the top at a later stage, we just want to see the colour ina nd judge how far it should go over the shoulder once it’s a bit more complete. 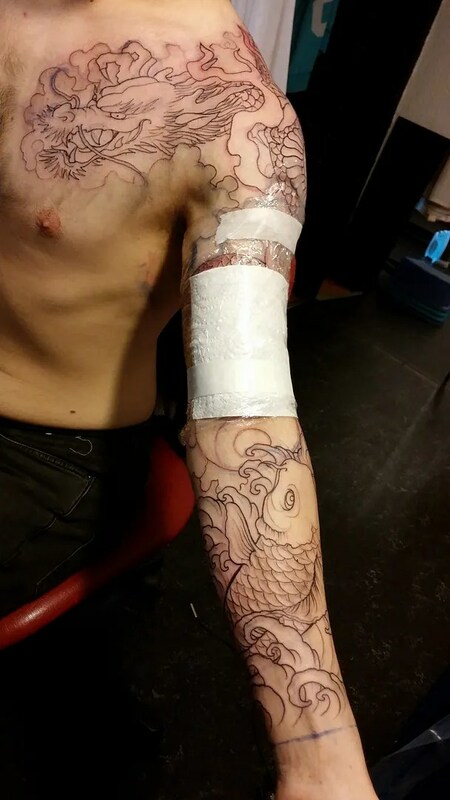 very sorry about these photos. 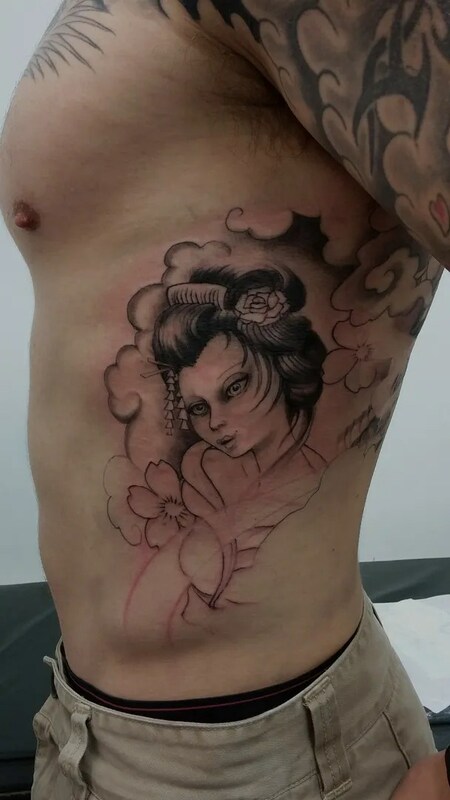 terrible. 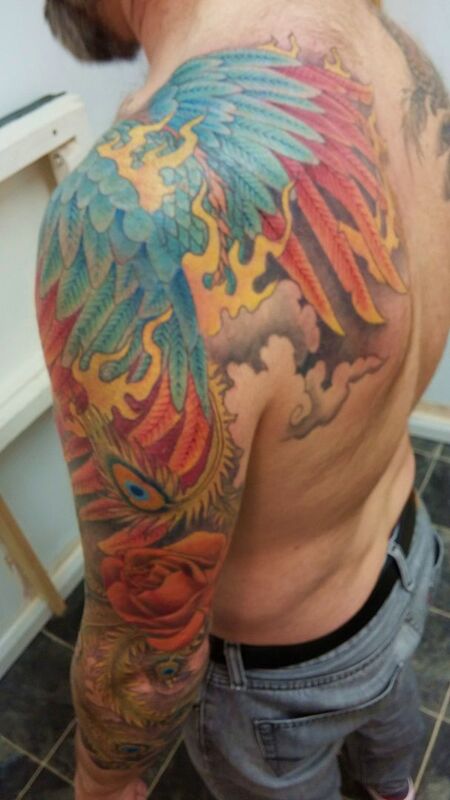 and i finished david’s phoenix, considering this was originally going to be a mostly black and grey piece, we managed to get some serious colours in there! 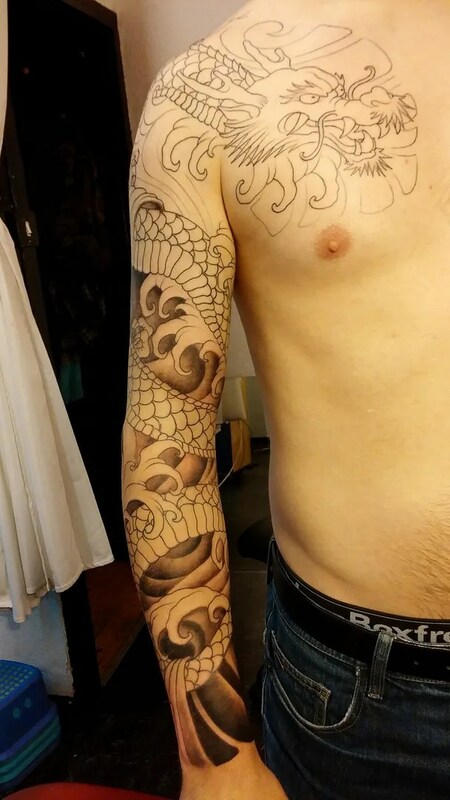 A change of plan is always a possibility with projects like this, and that’s just fine. 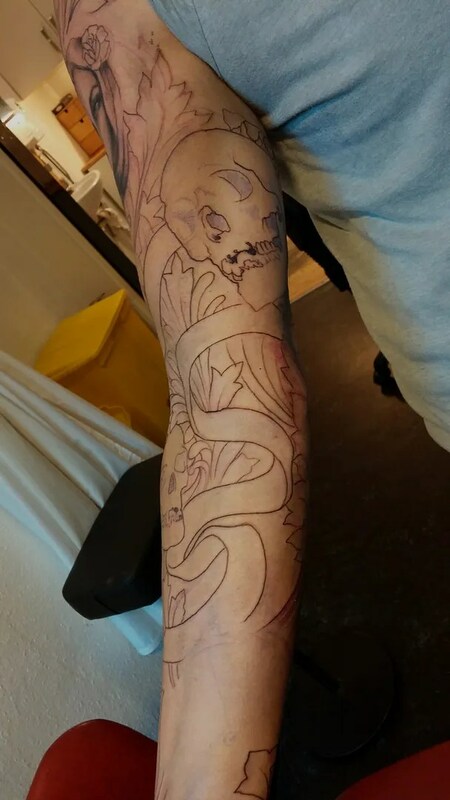 it’s an organic process..